The use of dogs in educational settings has been growing. Consequently, there is much more research relating to the practice. Often classroom dogs are referred to as therapy dogs. We will be using the term companion dogs because I believe the term "therapy dog" implies that only children who have a specific need, anxiety or learning disability would benefit. My research has led me to believe there is a benefit to all of our children. Here are some questions you might have. What kind of dog would make a good companion dog? •Love to cheer others up! What kind of dog is Birdee? •She is a miniature golden labradoodle. •She's currently weighing in at 20 pounds- she is a perfect lap dog! •She does not shed and is hypo-allergenic. •She has had all her appropriate shots and comes with an 80 point Vet check. •She received a 100 point socialization test and has been acclimated to children in a preschool as well as an assisted living center. 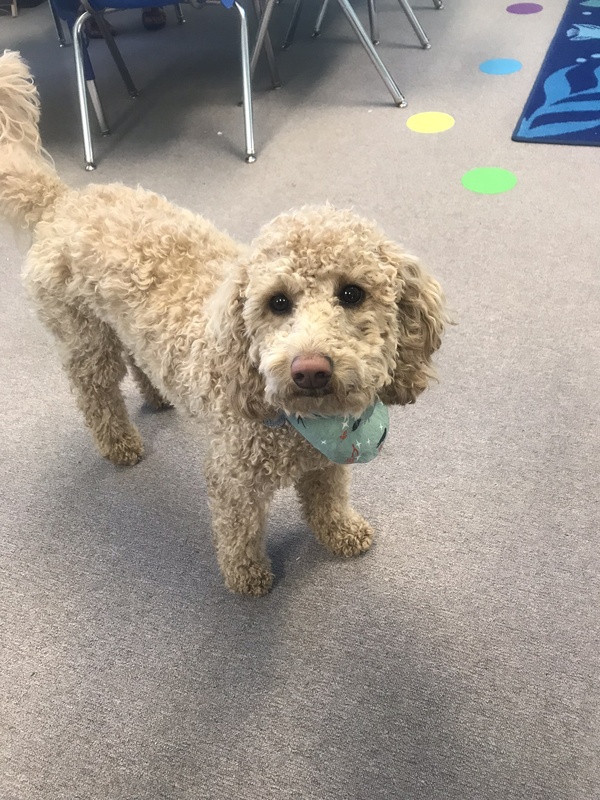 •She was NOT purchased with donation money or tuition money but is the Sheplee family's (Mrs. Sheplee) personal dog whose "job" will be serving as a "Companion Dog" for Fairmont Christian School. •Ranked by the AKC as one of the top friendliest dogs, this breed is very smart and love learning new things. 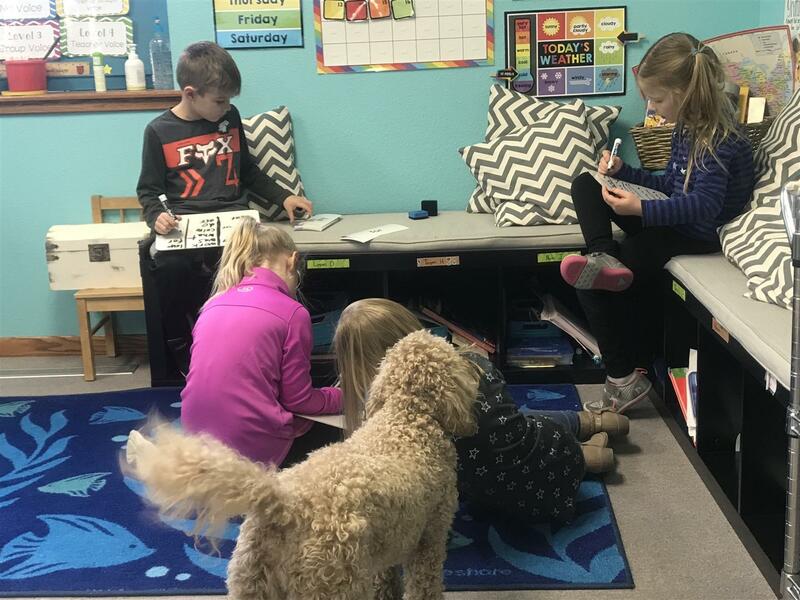 What are the benefits of having a companion dog in the classroom? •Spending time with a dog is a natural stress-buster for children. Interestingly, interaction with dogs has been shown to reduce blood pressure, provide physical stimulation and assist with pain management. Even though we do everything we can to reduce stress in our school, often some children's personalities lean toward being anxious. Taking a few minutes during the day to pet Birdee can help a child manage stress which is a valuable skill. •Teach responsibility. There is no better way to learn a skill than to teach it. Teaching a dog to obey will help us obey. Additionally, training a dog helps younger children who struggle with prepositions such as beside, on or over. Children can manage simple tasks such as filling the dog's water and food bowls. We will also take turns grooming and walking the dog under supervision. Our children will gain confidence by having the responsibility of caring for a dog. •Cognitive benefits. It has been empirically proven that a companion dog stimulates memory and problem-solving skills. Dogs can also help children with speech issues or those who are working to develop their skills. In this way, Birdee will give not only social and emotional support but also cognitive language skill support to children. The simple presence of a dog provides a verbal stimulus to help your child practice talking and socializing with another being. As we work on oral presentations and speeches, Birdee is our "practice partner." She will also "hang out" in the reading corner to listen to children read aloud. As they read to Birdee, confidence increases. •Social benefits. A dog promotes greater self-esteem and loves unconditionally. The kindness and the gentleness of a companion dog help children simply by being there. A dog can comfort, give support, and listen to a child's troubles without judgment or consequence and, when playing, a dog can become a child's partner and best buddy. A recent national survey found that about 8 to 10 percent of children have an anxiety disorder. We do not know if this will be true for the children who come to Fairmont Christian School, but we do anticipate that Birdee will lift moods in the classroom, perhaps provoking laughter. Birdee will also help teach empathy. As our children learns to read Birdee's needs: Is she hungry? Does she need to go outside? Maybe the dog is scared of the wind, rain or snow and needs to be comforted, she will help us be more empathetic people. Because a dog will love your child no matter what he says, Birdee will gives him a confident, a safe place in which to verbally pour out his fears and his concerns. I believe Birdee can be a special friend. •Help children with autism or special learning disabilities. 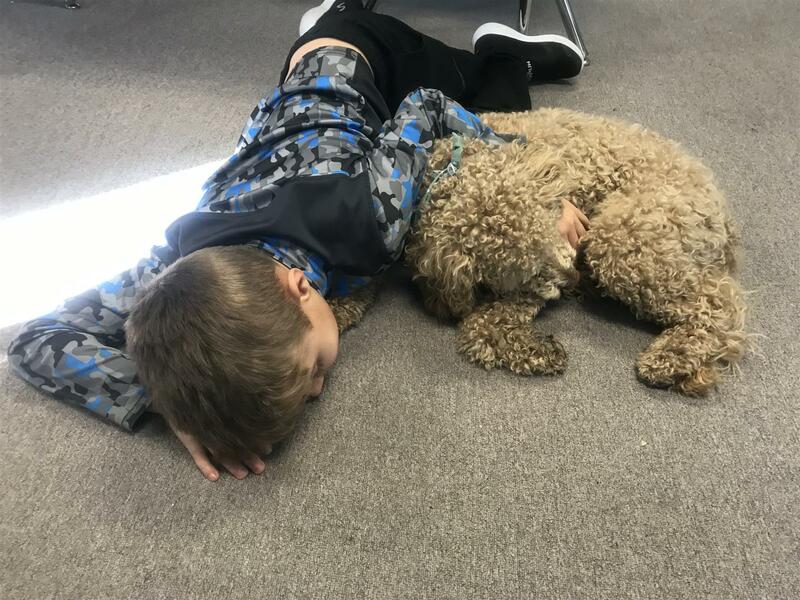 While dogs have calming effects and reduced stress levels in most students, children with disabilities can present a unique challenge. Because of the wide range of intensity, behaviors can be unpredictable. Currently, within our preschool and school family, we have several children who are on the autism spectrum. Also, there is a trend in some educational settings to be quick to medicate children. While there are times this is in the child's best interest, I personally believe that children need other options for dealing with their unique situation. It has always been our goal at Fairmont Christian School to teach every student multiple strategies to deal with their own behavior. The classroom can be a stressful and overwhelming environment due to social challenges and peer pressure. Companion dogs can reduce the effect of this allowing a child with autism to feel more at ease and open to social behavior. Researchers have found that children with autism are more social when playing with dogs as opposed to toys. New research offers further proof that animals can also have a therapeutic effect. The kindness and the gentleness of a companion dog help children with autism simply by being there. The child may not speak or may want to engage in compulsive behavior and the dog is by his/her side, ready to engage. How often will Birdee come to school? Birdee comes to school 2-3 days a week, and when in the classroom she loves to find a special spot and lay down. Her job is to help us be better students and better people. The teachers will make sure that she is not a distraction but a helpmate.